Why do Scouts sing around a campfire? A campfire is a fire lit at a campsite, to serve the following functions: light, warmth, a beacon, an insect and/or apex predator deterrent, to cook, and for a psychological sense of security. In established campgrounds they are usually in a fire ring for safety. 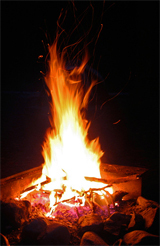 Campfires are a popular feature of camping, particularly among organized campers such as Scouts or Guides. Bumble Bee is a Favorite SongScout Song. User your leader's name instead of 'my leader' if it fits. I found at camp a baby bumble bee Won't my leader be so proud of me? I found at camp a baby bumble bee... Ouch! It stung me! (squish hands together) I'm squashing up my baby bumble bee Won't my leader be so proud of me? I'm squashing up my baby bumble bee... Ew! What a mess! I'm licking up my baby bumble bee Won't my leader be so proud of me? I'm licking up my baby bumble bee... Ugh! I feel sick! (hold stomache and bend over) I'm barfing up my baby bumble bee Won't my leader be so proud of me? I'm barfing up my baby bumble bee... Oh! Another mess! I got it before it got me! Audience echoes each line and sets up clap/lap-slapping rhythm. Goin’ on a lion hunt. Make sloshing sounds and move hands as if slogging. Make gestures climbing up and down. Go in it and find lion. Reverse all motions quicky to get home. Ging gang, Gooli gooli gooli gooli, Watcha, Ging gang goo, Ging gang goo. Hayla, hayla shayla, Hayla shayla hayla hoooooooo. This song is sung as round, this means there can be up to several groups singing it. The first group starts, the second group chimes in when the first group reaches "Hayla, oh hayla," the next group follows in the same manner. Here's a sample of this song courtesy of YouTube. See how they wriggle and squirm. Nobody knows how much I thrive On worms three times a day. Once there was a little Jeep, The sweetest little Jeep you ever did see, The Jeep was on the wheels, The wheels were on the GROUND, and the fire in the engine makes the wheels go round. Once there was a little seat, The sweetest little seat you ever did see, The seat was on the Jeep, The Jeep was on the wheels, The wheel were on the GROUND, and the fire in the engine made the wheels go round. Once there was a little monkey, The sweetest little monkey you ever did see, The monkey was on the seat, The seat was on the Jeep, The Jeep was on the wheels, The wheel were on the GROUND, and the fire in the engine made the wheels go round. 12 Days of Summer Camp - Tune: "The twelve days of Christmas"
On the first day of summer camp My mother sent to me... A box of oatmeal cookies. On the second day of summer camp My mother sent to me... Two T-shirts, And a box of oatmeal cookies. On the third day of summer camp My mother sent to me... Three pairs of socks, Two T-shirts, And a box of oatmeal cookies. On the fourth day of summer camp My mother sent to me... Four woolen caps, Three pairs of socks, Two T-shirts, And a box of oatmeal cookies.